32) Briefly state the type of inks required for Letterpress process of printing. Letterpress process involves printing by relief imaged blocks or composed metal types or combination of both and therefore the ink properties should be such that it stick on to the surface of the metals (type faces and blocks) and then transfer the same amount of ink on to the surface on which they are printed. Therefore the ink should neither be very hard, nor very soft. Since the blocks or type matter directly contact the paper surface, the inks formulated are such that they dry on paper without pulling away the paper fibbers from surface as the inks are slightly more viscose (thicker) in nature than the Offset inks. Also the inks will have to quickly dry on the coated surface of the paper without causing back side impression called set off. At the same time the ink should not dry on the metal types or blocks before getting transferred on to the paper surface. Letterpress uses moderate thick (paste) inks whose tack varies according to the speed of the machine deployed. The type of substance used for printing by Letterpress is both coated and non coated paper and therefore the ink required for this process has to dry by absorption (penetration), oxidation, or by polymerization through evaporation depending upon the kind of stocks being printed. Almost all letterpress inks are translucent which means that when one color over another is overprinted it creates a third color. The technologist say that the pigmentation of Letterpress ink is generally in the range of 15 to 25 %, rest being varnish, driers, resins etc. 33) What type of ink is required for Offset process of printing ? Offset Printing inks are more viscous than other inks used for other processes. The ink film is thinner in offset printing and therefore the pigment content must be higher which is up to 25 % as the technologists say. Deposit of ink films in Offset are about half the thickness of films deposited in letterpress process. And since offset printing is based on the fact that oil and water do not mix, inks formulated for the process contain significant amounts of water-repellent materials. The inks may have to withstand reaction from the fountain solutions in wet Offset which has certain chemicals. Therefore the inks should not emulsify and impair the body of ink, its shade or drying properties of the ink or cause tinting on the non printing areas of the plate and printed sheets. In Dry Offset printing the ink from the rollers get directly charged on to the relief plates and are not only different from the ink used on wet Offset printing machine, but are also different from Letterpress inks. The quality of ink used on Dry Offset is such that a thin layer of ink from the plate is transferred on to the blanket surface without smudging and set off. Sheet fed offset presses primarily use partially quick drying inks, which dry rapidly without the drying apparatus. However some of the modern Offset machines are equipped with radiation curing devices, as is needed for quick-set infrared ink, ultraviolet curing ink, and electron beam curing ink and therefore the composition of the inks are entirely different than conventional Offset inks. The Web offset inks tend to be less viscous and have less tack than sheet fed Offset machine inks. 34) What is called slurring in Offset printing? This is one of the most common printing defect noticed in Offset printing especially while printing halftone images. During the printing process, when the blanket slightly gets loosened, or the paper slips at the end or the pressure between the plate cylinder and the blanket cylinder or between blanket cylinder with impression cylinder this defect is noticed to occur. This is also a kind of doubling so claim the printers. If the paper is wavy, it can also cause this defect. 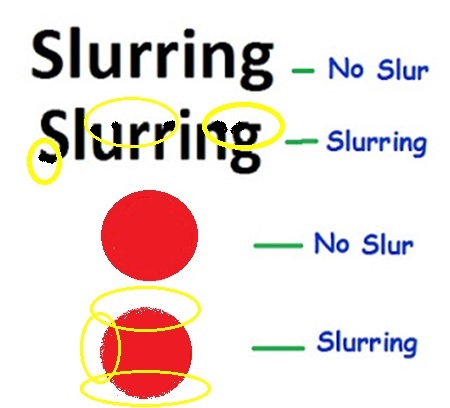 How will Slur look like? It will be a blurred image or a ghost image that will show enlarged the dots at the edges due to pressure in cylinders. The edges of the enlarged dots will also be unsharp. 35) What is compressible blanket ? 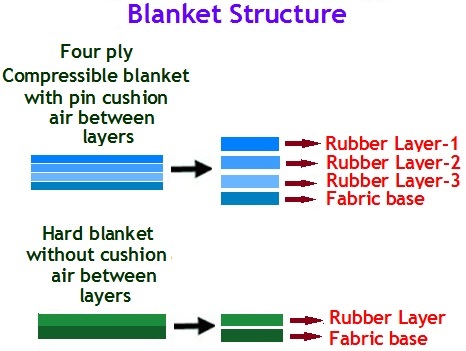 Blankets called compressible blankets made up of fabric and few rubber layers with air cushion inside each layer is fastened to the blanket cylinder on an offset press to receive the ink from the plate and then transfer it on to the paper. These blankets are made of supporting fabric and a rubber composition. Various rubber materials are used for manufacturing these blankets and most of the printers prefer compressible type of blankets on the machines even though slightly rough blankets are also used by some of the printers, but the use depends on the type of machines they have. Generally the compressible blankets are constructed with two, three or four plies of a strong woven fabric fastened together with thin layers of rubber coating. The number of fabric layers equals the number of ply. For example two to four ply blankets would have two to four layers of rubber coating on them. 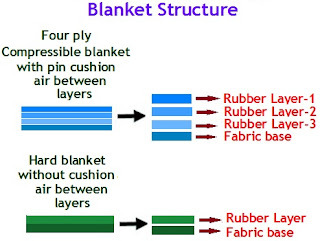 To make the blanket compressible a thin uniform layer of air cells (for compression) is layered between the fabric and rubber face. 36) What are the good qualities of an Offset Blanket ? Free from pinholes, and blemishes which could affect print quality. Surface should be non-abrasive to reduce plate wear. Should have uniform surface hardness and capable of transferring true image from its surface. Uniform coating of rubber layer over the fabric. Uniform matte surface with no low spots or raised areas. Should be resist to cleaning solvent and varnish used on the machine. Should be ink receptive failing which image transfer will be affected. The blankets should be resistant to peeling, blistering, embossing, glazing or tackiness, and also abrasion from paper or board. Should be capable of releasing the inked image from its surface quickly and uniformly.